Our Products >> Still Captive? This book is the work of 14 separate individuals who came together out of a mutual passion: that of teaching journalism. Although all the authors are college or university professors, almost all of them began their journalism journey in a high school classroom — most in a newspaper class, many in a yearbook class. Unfortunately, not all of them see the same enthusiasm for the subject that they remember. What they see in college classrooms are students who think they can jump right into being a sports analyst for a network or a fashion editor for a major publication, all as first jobs out of college. Many who come to higher education without a high school journalism experience come without the necessary critical thinking, creative thinking, collaborative and communication skills. That is the reasoning behind this book: not just to discover the state of high school journalism, but a way to help teachers improve their own skills. This work is for teachers who either are or will be teaching high school journalism and people who are interested in preserving the programs. The first part of this work is a look at the state of high school journalism in America in 2014. This includes a nationwide survey with the results in Section One. For teachers who want to argue for support in terms of newer technology, working with local professionals, additional certification or other issues, this section provides that information. Section Two was developed because it became apparent early on that many high school journalism teachers had no idea about the federal court laws which govern what they teach. 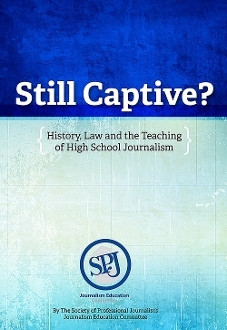 The three chapters take teachers from the earliest history and laws through the Hazelwood decision and slightly beyond – cases that have significant impact on governance of scholastic news media. Section Three turns back to the classroom itself and discusses the basics of high school journalism, how outstanding programs have survived, teaching the 4Cs, how teachers can best use available workshops and incorporate more professional assistance in their classroom. The final section gives all the conclusions about what can be done to improve high school journalism, plus an annotated bibliography for anyone who wants to conduct further research in this subject, and brief biographical sketches of the authors and editors of this work. Also added is the original survey sent to 600 high school teachers. It is the sincere hope of the SPJ Education Committee that this work is of assistance to scholastic programs throughout the country.